“As president, I have a solemn responsibility to protect our nation and our people. And when the system fails, it is my responsibility,” Obama said. I have learned that when Obama says, “The buck stops here!” the buck is just on a layover. And this was indeed the case recently. Just after saying, “The buck stops here,” Obama was notified that an appropriate scapegoat who allowed the terrorist to board the plane in Detroit had been found. The culprit is Deputy National Security Adviser John Brennan. Who knows what he got to do the mea culpa? So aside from the good news of passing the buck, the ancillary benefit for Obama is, like with Biden, Obama has exposed America to yet another incompetent white guy! Who cares that Obama picked them both! The buck stops THERE! In the spirit of transparency, Obama informed America that when terrorist suspects are found, they will be exposed. As we say, “Put on Front Street.” I can hardly wait to see the transparency involved here. Obama exposing Muslims and African. I guess we will get three days of visibility to review their mugshots on the internet, before they are publicly waterboarded. No, we will put them in explosive underwear, and draw lottery tickets on who gets to detonate. Wait, that is what would happen if I were POTUS! The question for me is why hasn’t protecting America’s citizens been a priority to begin with? The president’s #1 job is the protection of America. Was Obama not aware of binary explosives? This is scary stuff! And guess who is doing all this planning, people willing to blow off their naughty bits for the sake of Allah? Crap…I gave it away! Yes, young men with names like Abdullah and Muhammed, and who look like Muslims and Africans. Obama’s potential solution to the problem: Racial profiling. There it is America, a black man profiling people of color! GASP! You got it…it’s all Bush’s fault! White House gobblety-goop explained: So the same intelligence community that allowed NO attacks under Bush, has allowed two attacks under Obama and eight other major incidents? I know…it’s Bush’s fault! Incompetence is infectious, and there is a pandemic in the Obama administration. Despite what you were told about Bush being dumb, Obama makes Bush look like Einstein! Obama has never taken protecting America seriously. He believed that his mere presence was protection enough for America, because that is how narcissists think. Why would anybody want to attack America, if it is governed by a GOD?! Because of Obama’s vanity, America’s security has taken ten steps backwards, and his “leadership” is truly the blind leading the blind. 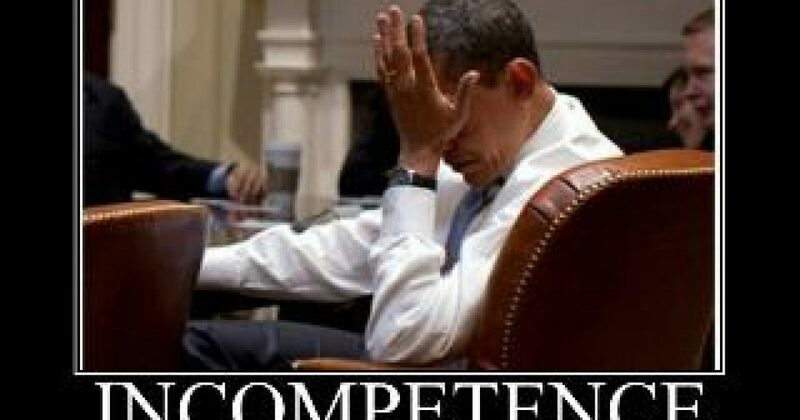 Obama’s incompetence is exceeded only by his ability to find people equally incompetent and in many cases more; something I thought was impossible! I find it ironic that a man who calls waterboarding torture, and attempts to rid the world of nuclear weapons would reference Truman’s plaque—the only president to authorize dropping the ultimate weapon…nuclear bombs. Though I am not a fan of former KKK member Harry S. Truman, he at least had the guts to protect America and save lives by taking the harsh step of bombing the enemy who attacked America by bombing Pearl Harbor. What do you think Obama would have done under similar circumstances? Pass the buck!